Behave responsibly should be standard. We consider it is normal to use paper from responsible sources that we can print on real paper even in 10 years later. It is definitely for us we want to reduce the environmental footprint of the press. We are thinking not only about the environment in which our children will live, but also allows us to reduce our costs. Paying all our obligations on time is considered an essential decency which can be determined in the Register of solvent firms. Quality control of our work is not just about the certificate ISO 9001/14001. It is all about the fact that our customers can already 20 years rely on of our service, deadlines and quality. We do not do it for marketing and we do not wait till our customers will demand it. 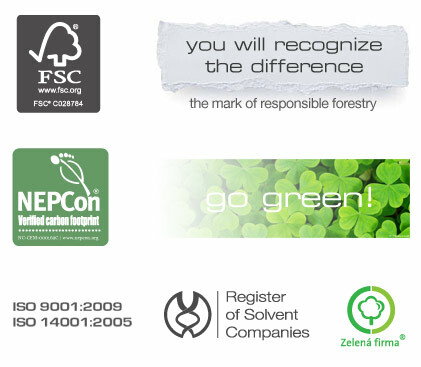 We were the first printing company in Prague which obtained FSC® certification. We are the first printing company in the Czech Republic which measures the carbon footprint and we are the only one who is able to provide the use of CO2 logos for printed product. We act so that we are proud of what we do and how. We are pleased our customers have appreciated it already 20 years. Neratov Association, origami heartfelt wishes for a good cause, charity fund Wine for Help, which helps families of children affected by the deadly disease, Adoption for Africa and other beneficent projects. We behave the way that makes us proud of what we are, what we do. We are glad that our customers appreciate it for more than 20 years.